One of my biggest challenges across my social media presence is separating the wheat from the chaff. How do I make sure I’m hearing from my most important sources without resorting to ignoring the others? And how can I do this without having to scour across a number of aggregators many times a day? A recent tweet from @scobleizer led me to a web service which seems to answer all these questions. 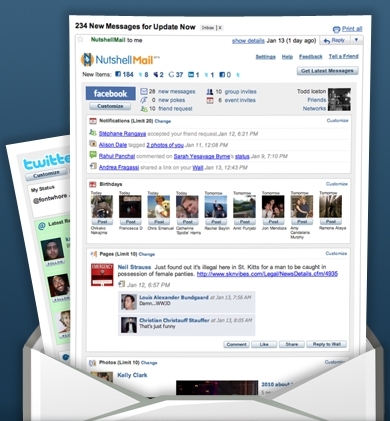 NutshellMail is a service that sources updates from across your social networks (Twitter, Facebook, MySpace, LinkedIn, Ning and webmail) and sends you the most relevant updates via email. In description, it sounds a bit unassuming. Tweaking a few settings will make you realise quite how spectacular it is. Firstly – what does “the most relevant updates” mean? Well, for each network you can configure what NutshellMail will inform you about. On Twitter, you can select which of your lists you want to see new tweets from and identify search terms to monitor. You can also monitor new followers, new quitters, direct messages and @replies. On Facebook, you can select what items you want updates on (notifications, new messages, photos, birthdays, etc.). You can select updates from specific friend lists only. You can also filter in (or out) specific application and page updates. As if that weren’t configuration enough, you can specify a maximum number of items to include in the email for each type of update. On LinkedIn, uhm, there’s not much to configure. It seems to be pulling a standard set of updates. This includes new messages, status changes, etc. In keeping with the “configure everything” theme, you can set when you want to be emailed (how frequently, what time, etc.) and the format of emails and can trigger ad hoc updates. The service also allows you to bring in Ning, MySpace and various webmail updates although I’ve not tried these as they are less useful for me. and a similar mini-dashboard for each service included in your mail. I’ve been using it about a month now and it has changed my behaviour patterns on Twitter, Facebook and LinkedIn. Instead of checking the sites religiously, I tend to rely on NutshellMail for keeping me updated on the folk I specifically want to know about and for the others, I dip into Twitter and Facebook every so often. It’s such a simple idea, and so brilliantly executed. Read next: Noticing more Twt.tl links? Twitter's got your back.